It is not widely known that Jean-Jacques Rousseau, the great 18th century French philosopher, lived for a year in Staffordshire! 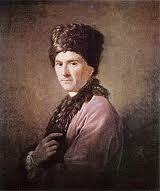 Rousseau was born in Geneva, in Switzerland, in 1712. At the age of 15, having lost both his parents and hating life as an apprentice engraver, he ran away, and after various adventures came to Paris in the 1740s. He was an excellent musician, good enough to have an opera and a ballet staged before the King, and wrote a number of controversial and widely-read essays. Besides his musical and literary talents, he was very good-looking and always got on well with upper-class ladies. Soon he was the darling of the salons, well-known to all the progressive intellectuals of the time, though he frequently disagreed with them. But his personal life was always troubled. He was always self-obsessed, with a strong masochistic streak, and suffered from persecution-mania which developed into a disabling paranoia. Increasingly he could find happiness only by retreating to seclusion in the countryside. For more than 20 years he lived unmarried with Therese le Vasseur, an illiterate kitchen-maid: they had five children, all of whom were given to a local orphanage - or so Rousseau tells us in his posthumously-published “Confessions”: scholars have always disputed how much of this was made up. In 1762 he published his most important book, “ The Social Contact”, which was quickly condemned for heresy both in Paris and his native Geneva, where his books were publicly burnt. Influential friends protected him from government persecution, but when in 1765 his windows were broken by a mob he fled from his home. The great Scottish philosopher David Hume, who was attached to the British embassy in Paris, suggested he should come to England. Rousseau arrived in London, without Therese, in January 1766. Just as in Paris, he was an immediate social sensation; he was feted by all intellectuals and had his portrait painted (in Armenian dress! see picture above) by Allan Ramsey. But, just as in Paris, he hated the attention he received in London, and accepted an invitation to stay at Wootton, the home of Richard Davenport, on the Staffordshire-Derbyshire border not far from Ashbourne. Rousseau arrived there in April, to find the area still frozen: something that present-day residents could well understand! He was joined there by Therese, who had been conducted from France by James Boswell - not yet the biographer of Dr. Johnson; at this stage just a young Scotsman on the make, who shamelessly intruded himself upon the great and famous. One local admirer was a young landowner, Sir Brooke Boothby. A few years later, Boothby had Joseph Wright of Derby paint his portrait: he is shown reclining full-length beside a stream in a woodland glade, with a volume of Rousseau in his hand; a setting of which his hero would doubtless have approved. Rousseau lived at Wootton for a year, working on his “Confessions“, until eventually his growing paranoia got he better of him. 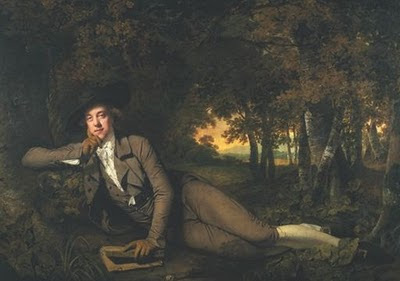 He turned down an offer conveyed by General Henry Conway of a royal pension of £100 a year, on the grounds that it too much resembled charity, and then a satirical article written by Horace Walpole convinced him that there was a gigantic conspiracy afoot to discredit him. Even Ramsey’s portrait, he imagined, was an attempt to make him look ridiculous. For some reason, he blamed David Hume, and published a ferocious attack on the Scottish philosopher, who was unwise enough to reply. Eventually Rousseau fled back to France, after appealing to Lord Chancellor Camden to provide him with armed bodyguards, and writing to the doubtless bemused Conway, warning him not to get involved in any assassination plots. There was a warrant out for Rousseau’s arrest in France, but he was protected by his powerful friends. In 1768 he married Therese, after living with her for 23 years, and resumed his secluded life in the countryside. He died in 1778.